Much of what the world knows about the drama and details of the demise of Flying Tiger 923 is the result of the writing of US Stars and Stripes newspaper reporter Master Sergeant Peter Foley, home-town Spokane, Washington. Foley was aboard the aircraft on his way back to Germany. Foley will always be known for his enthusiasm, cheerfulness and helpfulness throughout the tragedy as well as his skill and sensitivity as a feature writer. Relatively little is known about Peter’s personal life, except that his home town was Spokane, Washington. His wife’s name is Mary and at the time they had three children ranging in age from 15 months to 10 years. They lived in Darmstadt which is the European headquarters of the Stars and Stripes newspaper. Foley, 45 at the time, served for a period in World War II as an aircraft mechanic. On BOARD THE SS CELERINA, OFF IRELAND, Sept. 25, 1962 (UPI) – The battered survivors of the crash at sea Sunday have only praise for those responsible for their lives. Four hours after take-off from Gander, Newfoundland, at the point of no return, two engines had to be feathered [shut down]. The No. 1 had a runaway prop, and No. 3 had caught on fire. Althought he plane still had two engines and could fly for a long time, the stewardesses began a ditching drill. Spirits were high on the plane, and many of the young soldiers aboard – mostly headed overseas for the first time – kidded the stewardesses and said they wanted to be in the same life raft with them. Near the rear of the plane sat a newly married couple. The bride, on one of her first flights, began to cry, and her young husband was telling her there was nothing to fear. Real fear showed clearly in the eyes of the mother with two small children. It was near 7 PM when No. 2 engine (one of the only two remaining) started to shower sparks. Then there was a loud thump and No. 2 was feathered. One could feel the plane dropping now. Lights were turned out, so the eyes could get used to the darkness. Then the announcement, “get ready to ditch,” and within minutes came the hard crash and struggle to get out of the sinking plane. There was no panic, just everyone moving to the escape hatches. The seas were rough and the wind was blowing and in the black of night nothing but the struggling swimmers could be seen. Only the cries, “Where are the rafts? Where are the boats?” could be heard. When on the left side of the plane a raft did drift by, it soon became p-acked as exhausted swimmers were pulled on. In no time the wet and scared survivors were packed two deep in the 25-man raft. For nearly five hours, this mass of humans was tossed around by the seas, often sprayed with cold water, and most of the time waist deep in water. Hours passed slowly, and search planes overhead added much to the hope that help would soon be on the way. The raft was upside-down and all emergency equipment was out of reach. Only a flashlight salvaged by Plane Captain Murray was on the raft and this proved to be the life-saving piece of equipment. Only a few could move in the raft. Those in the center had to keep their heads above the water. Those along the sides had to try to help bail out the rising water. It was the plane’s navigator, Samuel T. Nicholson, with a cap and plastic bag, who kept the water level down. It was when the raft was caught between two waves and almost folded in half that hurt the most; for this movement jammed the mass of survivors even tighter together and cause the most cries of pain. The lights of the cirling plane on guard over the area kept spirits alive. Several lights on the distant horizon would bring shouts of “a ship is coming,” but most of these lights turned out to be the last light of flares dropped by the rescue planes. The rising moon was first thought to be a ship on its way to help. The first sure sign of help was when the green running light of this ship was spotted. It was almost an hour later when the ship’s searchlight — guided by the lone flashlight on the raft—spotted the raft. The ship’s captain said, “If it was not for the flashlight, it would have taken much longer to find the raft. It took more than two hours to get the 51 people aboard the ship. Most of the survivors suffered cuts and burns. All suffered from exposure. During the first hours in the raft the survivors sang, tried joking and prayed. At no time did the majority lose hope. Even so, death claimed three lives and surely would have taken more if help hadn’t arrived when it did. 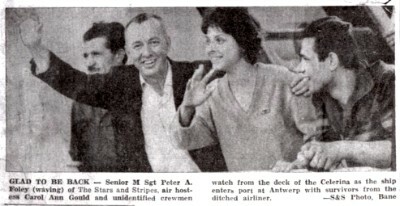 In this photo, Foley is seen with surviving flight attendant Carol Ann Gould Hansen and unidentified crewmen on the deck of the Celerina as it pulls into the port of Antwerp, Belgium. This entry was posted in passengers. Bookmark the permalink. Pete Foley was a vibrant man who loved life and had strong survival instincts which were severely tested a number of times. After a stint in the Merchant Marines, Pete worked in the copper mines around his hometown of Butte, Montana. He was a motorman and it was his responsibility to drive the ore cars in and out of the mine. One day, the “hottest and worst” mine caved in trapping many men. Luckily, they found an airway to crawl through until they reached a spot where rescuers could drop metal cages and pulled them out. Pete later enlisted in the US Army Air Forces. During World War II, he worked as an airplane mechanic. He wasn’t in combat but again escaped death in 1945. At the age of 28, he was on a cargo plane that got lost and ran low on fuel. According to Pete, “I was on leave, going to visit somewhere. I happened to pick the wrong plane. ” Luckily, everyone on board was able to parachute out of the plane before it crashed. Pete described his free-fall through clouds and with birds, as a thrill – not a fright, and an experience that ended too soon. His parachute landing was smooth and something he “thoroughly enjoyed”. Pete served in Korea from May 1950 through June 1953; his decorations included the Bronze Star, the Republic of Korea Presidential Unit Citation, the Korean Service Medal, the United Nations Service Medal and the Air Force Commendation Medal. Pete was a graduate of the Armed Forces Information School and the Strategic Air Command NCO Academy. In 1951, Pete married Mary Wallace of Helena, Montana in Yakahoma, Japan. Like many military families, the Foley’s had duty stations throughout the United States and the world. In 1962, after completing an assignment in Nevada for Stars and Stripes, the military newspaper in Europe, he boarded Flying Tiger Flight 923 to return home to his pregnant wife and five children in Darmstadt, Germany. As problems began to unfold, another passenger asked him if one of the four engines quit running, how the plane would fare. Pete’s response was to “stop worrying, this plane could fly forever”. Then the second engined failed. After the third engined failed he, and everyone else, knew the plane was in trouble, but there was no time to panic. Following is how Pete described his experience. Pete retired from the Air Force in 1965 and moved his family to Citrus Heights, California (a suburb of Sacramento). He was a smart person, loyal to family and friends, an enthusiastic supporter of his family activities, an adventurer, a teacher, a hard worker and a wonderful example of how to get a job done. He and his family were very active in community and school activities. They loved to travel, camp, boat, water and snow ski, ocean dive and always enjoyed a good party. In 1981, Pete and Mary bought a struggling business that supplies beneficial insects for pest control and turned it into one of the large supplier of ladybugs in the US. In 2001, Pete and Mary celebrated their 50th anniversary. Later that year, Pete lost his battle with melanoma and died in November. People often say they will die for someone they love. Pete’s character, however, was to focus his strength and energy on living for the people he loved and helping them to have a good life. Pete Foley lived a very good life.